What will you be wearing this fall? Check here for daily reports from the front lines of fashion. We'll have designer profiles, backstage access, front-row interviews and our runway report cards. 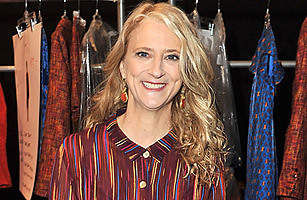 With her whimsical, yet classic approach to ready-to-wear fashion, Nanette Lepore has become the go-to designer for women of all ages who are looking to make a bold sartorial statement. Her latest collection debuted Feb. 15 at New York Fashion Week, painting a picture of what every woman would like to wear come fall: Tailored jackets, luxe textures and colors that pop among a sea of black. TIME caught up with Lepore before the show to talk about her inspirations, favorite pieces and whom she considers her ideal customer. What was the inspiration for your fall-winter collection? It's a mix of Oscar Wilde, dandyism, a deck of tarot cards and a little bit of mysticism. It's like a fun dance party. Can you tell me a little bit about your color palette? It's a beautiful mix. The colors are great  a deep flame orange and a dark turquoise, chartreuse, and it's all played off a deep mulberry. No blacks or dark browns this season. It's all about the color. I love the first coat that's opens the show, although the print is absolutely killing us! There's all these different gradations to the way it's dyed and colored, so when you have to do repeats and mass cut them, it's deadly. So we're going to spend the next three days trying to figure that out, but I still love it. Is there a celebrity who you would love to dress but haven't had a chance to yet? Lady Gaga (laughs). And the cute one, Carey Mulligan. My daughter (Violet) would love it if I dressed her. Your brand has such wide appeal. Who would you say is your ideal woman to dress? I want to dress all of them, from 13 to 60. They're all ideal. Everyone from Arianna Huffington (who had a front-row seat to the Fall show) to Abigail Breslin. I want to keep that diversity.